Imagine we could control the weather - pushing a button to make it warmer or cooler, wetter or drier. Clever as humans are, however, we're nowhere near precision control of the weather. Outside, at least. Ever since our ancestors mastered fire, humans have been able to warm themselves. Cooling down when it's hot has been more challenging. The eccentric Roman emperor Elagabulus sent slaves to bring snow down from the mountains and pile it in his garden, where breezes would carry the cooler air inside. Needless to say, this was not a scalable solution. At least, not until the 19th century, when Boston entrepreneur Frederic Tudor amassed an unlikely fortune doing something similar. He took blocks of ice from frozen New England lakes in winter, insulated them in sawdust, and shipped them to warmer climes for summer. Until artificial ice-making took off, mild New England winters caused panic about an "ice famine". Air conditioning as we know it began in 1902, but it had nothing to do with human comfort. New York's Sackett & Wilhelms Lithographing and Printing Company became frustrated with varying humidity levels when trying to print in colour. The same paper had to be printed four times in four colours, and if the humidity changed between print runs, the paper would slightly expand or contract. Even a millimetre's misalignment looked awful. The printers asked heating company Buffalo Forge to devise a system to control humidity. A young engineer called Willis Carrier figured out that circulating air over coils that were chilled by compressed ammonia maintained the humidity at a constant 55%. Buffalo Forge was soon selling Willis Carrier's invention wherever humidity posed problems, such as to flour mills and the Gillette corporation, where excessive moisture rusted the razor blades. These early industrial clients didn't much care about making temperatures more tolerable for their workers - that was an incidental benefit. But by 1906, Carrier was exploring the potential for "comfort" applications in public buildings like theatres. It was an astute choice. Historically, theatres often shut down for summer: no windows, human bodies tightly packed together and, before electricity, lighting provided by flares. New England ice had been briefly popular. In the summer of 1880, New York's Madison Square Theatre used four tons a day: an eight-foot fan blew air over the ice and through ducts towards the audience. Unfortunately, though cool, the air was also damp, and with pollution increasing in New England's lakes, the melting ice sometimes released unpleasant smells. Willis Carrier's "Weathermaker" was much more practical. The general public first experienced air conditioning in the burgeoning movie theatres of the 1920s, and it quickly became as much of a selling point as the films. The enduring Hollywood tradition of the summer blockbuster traces directly back to Carrier, as does the rise of the shopping mall. But air conditioning has become more than a mere convenience. It is a transformative technology, which has had a profound influence on where and how we live. Computers fail if they get too hot or damp, so air conditioning enables the server farms that power the internet. Indeed, if factories couldn't control their air quality, we'd struggle to manufacture silicon chips at all. Air conditioning has also revolutionised architecture. Historically, a cool building in a hot climate implied thick walls, high ceilings, balconies, courtyards and windows facing away from the sun. Image caption The invention of air conditioning radically altered housing in America's so-called "sun belt"
The dogtrot house, popular in America's south, was bisected by a covered, open-ended corridor to let breezes through. Before air conditioning, glass-fronted skyscrapers were not a sensible option: you'd bake on the upper floors. Air conditioning has changed demographics, too. It's hard to imagine the rise of cities like Dubai or Singapore without it. As residential units spread rapidly across America in the second half of the 20th century, the population in the "sun belt" - the warmer south of the country, from Florida to California - boomed from 28% of Americans to 40%. As retirees in particular moved from north to south, they also changed the region's political balance. The author Steven Johnson has plausibly argued that air conditioning elected Ronald Reagan. Reagan came to power in 1980, a time when America used more than half the world's air conditioning. Emerging economies have since caught up quickly: China will soon become the global leader. The proportion of air-conditioned homes in Chinese cities jumped from under a tenth to more than two-thirds in just 10 years. In countries like India, Brazil and Indonesia, the market for air conditioners is expanding at double-digit rates. And there's plenty more room for growth: 11 of the world's 30 largest cities are in the tropics. The boom in air conditioning is good news for many reasons. Studies show that it lowers mortality during heat waves. Heat makes prison inmates fractious - air conditioning pays for itself by reducing fights. When the temperature exceeds 21C or 22C in exam halls, students start to score lower in maths tests. In offices, air conditioning makes us more productive: according to one early study, it made US government typists do 24% more work. Economists have since confirmed that relationship between productivity and keeping cool. William Nordhaus divided the world into cells, by lines of latitude and longitude, and plotted each one's climate, output and population. The hotter the average temperature, he found, the less productive the people. According to Geoffrey Heal and Jisung Park, a hotter-than-average year is bad for productivity in hot countries, but good in cold ones. They conclude that human productivity peaks at between 18C and 22C. But there's an inconvenient truth: you can only make it cooler inside by making it warmer outside. Of course, that makes air conditioning units work harder, making the outside hotter still. On underground metro systems, cooling the trains can lead to swelteringly-hot platforms. Then there's the electricity that powers air conditioning - often made by burning gas or coal - and the coolants air conditioners use, many of which are powerful greenhouse gases when they leak. 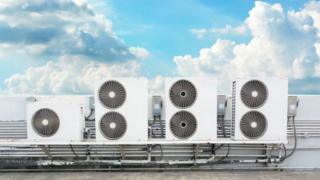 Air conditioning technology is getting cleaner and greener. But demand is growing so quickly that - even if the optimists are right about possible efficiency gains - there'll be an eightfold increase in energy consumption by 2050. That's worrying news for climate change. When will we get inventions to control the outdoor weather, too? Air-conditioning: Why might women feel temperature differently from men? What happened to the Qatar World Cup's cooling technology?